Achieving their goal participants in the Goal to Work programme in Ballina with course leaders Paul Byrne (FAI Development Officer), Anne Conlon (Conlon Training), Ray McNamara (Mayo Sports Partnership) were Lucas Kijowski, Jack Kavanagh, Aaron Murphy, Johnny Devanney, Declan O'Dea and Michael Regan. Photo: Heverin Print. 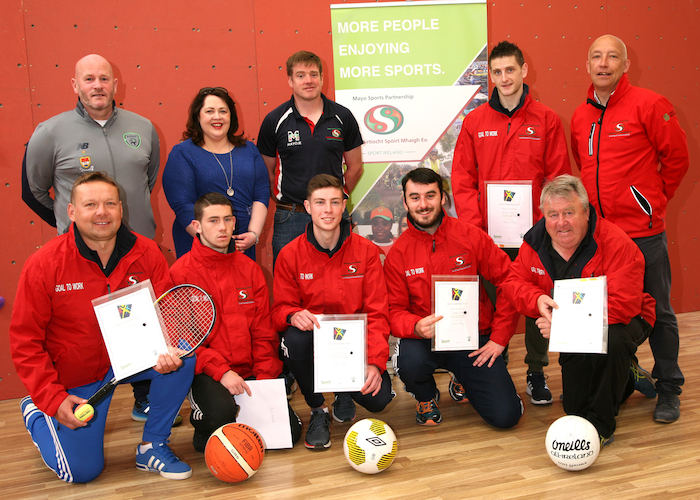 A group of people mainly from the Ballina area have just completed a 10 week long specialised sports coaching course which it is hoped will provide them with the tools to obtain part time employment. The Ballina Community Coaching Training Programme, which ran for three days each week in Ballina, allowed trainees to become fully qualified GAA, Rugby, Basketball and Soccer coaches with additional sports modules in safeguarding, first aid, disability awareness and little athletics completed. Trainee coaches also honed their skills and coaching in Scoil Iosa Primary School giving many school children some quality participation experiences. Cathaoirleach of the Ballina Municipal District Cllr Michael Smyth presented the newly qualified coaches with their Community Coaching Programme certificates at a presentation held in the Ballina Sports Complex. He commended the partners in the programme with the assistance of Sport Ireland and the Dormant Accounts Board in bringing the programme to the area. The partners include Mayo North East Leader Partnership, Mayo County Council, Connacht GAA, FAI, Connacht Branch IRFU, Basketball Ireland and Scoil Iosa where the coaching took place. In addition to the sports-related modules, training was also provided on how to set up a business, how to develop an enterprise idea and further educational/training opportunities, communication skills, progression routes and CV preparation, all designed to help participants to identify possible employment or training opportunities after the 10 week programme. Happily some participants were reported to have already gained employment while others may progress on to further training or gain part-time employment as sports coaches with local schools. Approximately 150 sports coaches/leaders have now received training under the Community Sports Coach programme and are available to assist communities, sports clubs and schools throughout the county. Sports Co-ordinator for the Mayo Sports Partnership Charlie Lambert explained: "These coaches are a fantastic resource to have in the county and we hope to invite some of them back for further training to assist us in delivering targeted participation opportunities for all." To find out more about the programme log on to www.mayosports.ie or contact Mayo Sports Partnership at (094 ) 9047025 email: [email protected]. Page generated in 0.1438 seconds.